In our search for the next wine exchange destination we emailed a few of Pittsburgh’s BYOBs that are candidate destinations for us. One of the first responses was from Cornerstone in Aspinwall. With little in the fridge tonight for dinner, we decided that we’d give our first candidate a shot. Although when we called the waitress didn’t give us a warm fuzzy, when we arrived we looked around a cozy dining room with a very relaxed crowd. If the weather were better, we may have sat at the inviting outside seating. 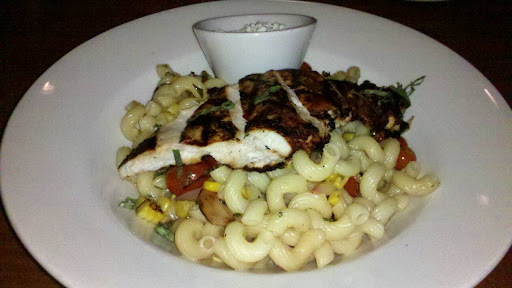 Cornerstone offers a seasonal menu with the summer menu lasting through the end of September. 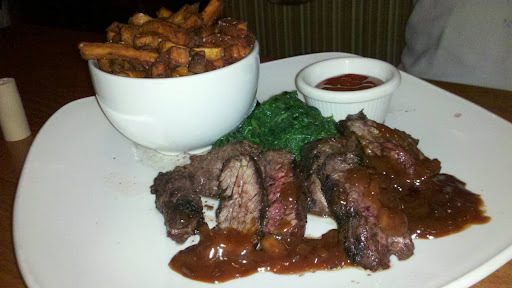 TasteBud A ordered the Hanger Steak with sweet potato fries, garlic spinach with a peach bbq sauce. I ordered the Chicken Capitavi. For dessert we shared an ice cream sandwich. 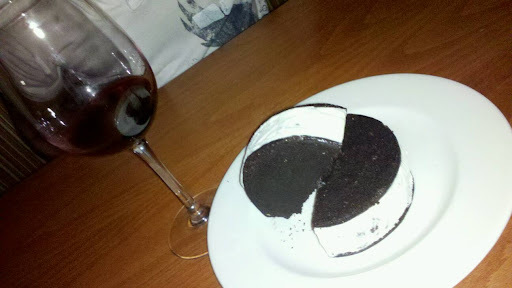 White chocolate rasberry truffle ice cream between two chocolate cookies. if the entree wouldn’t have been so filling we would have ordered each our own. I believe “this is bad news” came from TasteBud A’s mouth just one bite in. Previous Beat the heat with a YUMMY TREAT!